Stress is something many of us know all too well. The increased heart rate, inability to concentrate, problems falling and staying asleep, and crankiness are some of the physical and emotional responses we often experience under stress. 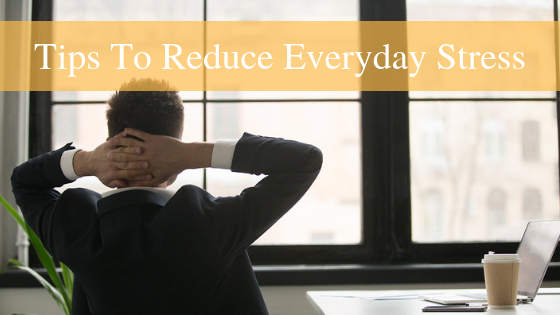 Stress can be brought on by many things: morning rush hour traffic, a presentation with a nearing due date, or an email inbox that is overflowing. It’s usually the little things that send us over the edge. While we specialize in urology, we recognize stress to be one of the leading causes of many health related issues–even urological issues. It is our intention to provide you with tips that will reduce your everyday stress issues and ultimately make you a healthier person! Medically speaking, stress is a normal reaction by the body to changes that require an adjustment or response. We can experience stress from our body, our thoughts, and our environment. Stress becomes negative when we face continuous challenges without breaks in between stressors, which builds tension and makes us feel overworked. The human body is designed to experience and react to stress, which keeps us alert, motivated and cautious. Our reaction to stress is a “fight or flight response” that is triggered by the body’s autonomic nervous system. Continued activation of the stress response causes the physical and emotional strain we feel. If stress continues without relief for a prolonged time, we can experience distress. Distress is a negative stress reaction that leads to more severe physical and emotional problems, like elevated blood pressure, depression or panic attacks. Everyone reacts to stress differently. Pay attention to the symptoms you experience. By knowing how you respond to stress, you can learn to manage it in healthy ways. If you feel like you may be dealing with a serious anxiety disorder, talk to a doctor. Inconsistent sleep is a big contributor to overall stress and anxiety. Try to schedule a full seven to nine hours of uninterrupted sleep time each night so you feel refreshed and ready to take on the next day. If this doesn’t help reduce your everyday stress levels or if you’re having trouble sleeping, visit a health professional or sleep disorders clinic for evaluation and treatment. Having a positive attitude can reduce your stress level, help you feel better about yourself and the situation, and improve your overall well-being. Try to look on the bright side of things instead of focusing on the negative things that bring you down and add to your stress. Push those bad thoughts and feelings out the door and let the good ones take over! Relaxation techniques like meditation, deep breathing, yoga or tai-chi can work wonders for your stress levels. These practices counteract the stress response and bring your body and mind back to a balanced state. With regular relaxation practice, you can increase energy and focus, relieve aches and pains, and boost motivation and productivity. Not all relaxation techniques work the same, so find the one best suited to you. Almost any form of exercise can act as a stress reliever. Regular exercise is a great way to boost endorphins, the brain’s neurotransmitters that make us feel good. It can also increase self-confidence, lower symptoms associated with mild depression and anxiety, improve sleep, and it can be relaxing. Whether it’s running, cycling, swimming, or lifting weights, find an activity you enjoy and make it a part of your regular routine. Struggling to meet deadlines or difficulty juggling multiple responsibilities at once are very common causes of stress. Manage your time effectively by creating clear plans and timelines for your work, and prioritize responsibilities by importance. By learning to manage your time, you can cut back on worrying about your progress which can make you feel overwhelmed. Having a time management plan will help you feel more in control of your responsibilities, and will give you more freedom to do the things you enjoy. Stress can cause a change in appetite, leading to overeating, under eating, or certain food cravings. The body needs certain nutrients to stay healthy and happy, and some foods do the exact opposite. Eating sugary and processed foods can actually increase symptoms of anxiety, so it’s important to stay away from those. Eat more foods that contain vitamin B, omega-3s, and whole-grain carbs which promote good mental health. Do you understand the USDA’s food pyramid and dietary recommendations? Saying “no” isn’t always the easiest thing to do. Even when you want to help, saying “yes” to every request will just add more responsibilities to your already overflowing plate. It’s ok to say no when someone asks for your help. It’s better to do this than to say yes and run into stress and anxiety later. If you really would like to help, consider what other commitments you have before making your decision. It’s almost impossible to avoid stress altogether. It’s natural to experience negative physical and emotional responses to change. But with regular stress management, you’ll be on the way to a happier, stress-reduced life. Looking to further promote a healthy lifestyle? We compiled all of our nutrition and healthy lifestyle tips into this comprehensive guide. Download your guide and you’ll see that a healthy and happy life is easier than you think.